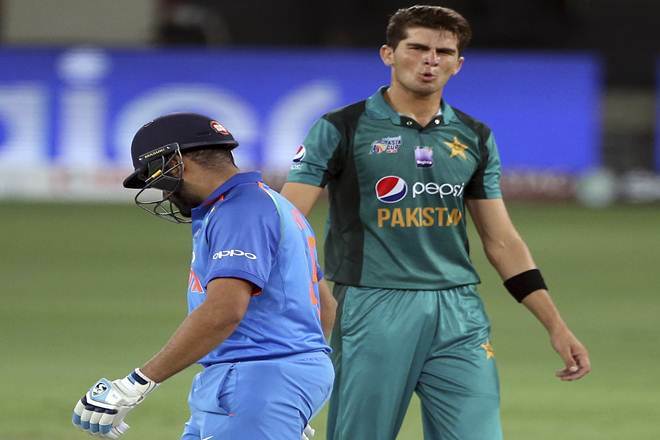 India vs Pakistan Score, IND vs PAK, Asia Cup 2018 highlights: Rohit Sharma, Shikhar Dhawan help India win by 9 wickets. India vs Pakistan Score, Asia Cup 2018: Both the sides would be hoping to cement their final spot. India vs Pakistan Score, IND vs PAK, Asia Cup 2018 highlights: Pakistan have set the target of 238 runs for India to chase. It’s senior player Shoaib Akhtar top-scored for his side with 78 runs off 90 deliveries. Skipper Sarfraz Ahmed also contributed with 44 runs in 66 deliveries. For India, Bumrah, Chahal andKuldeep Yadav took two each. Both Pakistani batsmen also shared a partnership of over 100 runs. Earlier, Pakistan skipper Sarfraz Ahmed won the toss and decided to bat first. While Pakistan is playing this match with two changes, Team India is playing with an unchanged team. India won their last match against Pakistan quite comprehensively and is hoping to repeat their performance against arch-rivals. The team that will win today will almost certainly play the final on Friday. India defeated Bangladesh by seven wickets in their last match. Men in Blue have hardly faced any trouble in the tournament so far with easy wins against Hong Kong, Pakistan and Bangladesh. The skipper has led from the front with the bat so far and has got good support from his opening partner Shikhar Dhawan while Amabti Rayudu and Dinesh Karthik have made the most of their chances too. Mahendra Singh Dhoni’s return to form was a big positive for the side and Ravindra Jadeja has added an extra dimension to the side. Rohit Sharma(c), Shikhar Dhawan, Ambati Rayudu, MS Dhoni(w), Dinesh Karthik, Kedar Jadhav, Ravindra Jadeja, Bhuvneshwar Kumar, Kuldeep Yadav, Jasprit Bumrah, Yuzvendra Chahal. Pakistan skipper Sarfraz Ahmed wins toss, elects to bat first. Moments after completing his 7,00 runs in ODI cricket, indian captain Rohit Sharma now hits a ton against Pakistan. India now need 9 runs to win with 9 wickets in hand. Shikhar Dhawan out after playing a splendid inning against Pakistan. He is run out. New batsman is Ambati Rayudu. India cruising towards win now. Now need 27 runs in16.1 overs. Shikhar Dhawan hits ton against Pakistan. india now need 29 runs to win against Pakistan with 10 wickets in hand. Meanwhile, Rohit Sharma reached his 7,00 runs mark. Rohit Sharma: 93* off 98 balls. Shikhar Dhawan: 99* off 94 balls. Shikhar Dhawan hits the boundary off the bowling of Shadab Khan. Men in Blue now need 60 runs, with 10 wickets in hand in 20 overs. Sharma batting on 84 runs and Dhawan on 94. It seems to be a one-way show now, with India India in comfortable position to win their match against Pakistan. Rohit Sharma: 81* off 87 balls. Shikhar Dhawan: 86* off 82 balls. Rohit Sharma hits a huge six off the bowling of Shadab Khan. The batsman hits the ball over deep midwicket. India now need 86 runs to win in 24 overs with 10 wickets in hand. Both batsmen have put on over 150 runs partnership. Team India is in comfortable position mow to win this match. Rohit Sharma: 55* off 69 balls. Shikhar Dhawan: 75* off 75 balls. After Shikhar Dhawan, Rohit Sharma hits half century. He is batting on 55 runs off 69 balls, while Shikhar Dhawan is batting on 67 runs off 71 deliveries. Men in Blue at 123/0 in 23rd overs. India now need 115 runs with 10 wickets in hand in 26.3 overs. Rohit Sharma, Shikhar Dhawan put on over hundred runs partnership. While Rohit Sharma is batting on 46 runs, Shikhar Dhawan is batting on 62 runs at the moment. Team India now need 129 runs to win with 10 wickets in hand in 29.3 overs. Indian openers Rohit Sharma, Shikhar Dhawan put on 86 runs partnership till now. While Rohit Sharma is batting on 39 runs, Shikhar Dhawan is on 45 runs. Team India 86/0 in 18th over. Men in Blue now need 152 runs to win with 10 wickets in hand. Rohit Sharma: 30* off 45 balls. Shikhar Dhawan: 44* off 51 balls. In the other match being played today, Bangladesh have set the target of 250 runs for Afghanistan to win. At the moment, Afghanistan is 29/2 in 13th over. Mohammad Shahzad is batting on 23 runs and Hashmatullah Shahidi is on 6 runs. Good start by openers as skipper Rohit Sharma and Shikhar Dhawan have together put on 43 runs partnership till now. While Shikhar Dhawan is batting on 25 runs from 22 balls, Rohit Sharma is on 18 runs till now. Rohit Sharma: 14* off 21 balls. Shikhar Dhawan: 19* off 17 balls. Openers Rohit Sharma and Shikhar Dhawan begin India's run chase against Pakistan. They will have to chase the target of 238 runs. Right now India 7/0 in 1.1 overs. Team India to start their chase against Pakistan soon. Men in Blue have been set the target of 238 runs in this important match. For Pakistan, it's senior player Shoaib Akhtar top-scored with 78 runs off 90 balls. Skipper Sarfraz Ahmed also chipped in with crucial with 44 runs in 66 deliveries. For India, Bumrah, Chahal and Kuldeep Yadav took two each. Pakistan have lost their 7th wicket as Asif Khan goes for 10 runs. Pakistan close to end their innings against India. In last 5 overs, Pakistan have scored 26 runs for the loss of two wickets. Its last over now with Mohammed Nawaz and Shadab Khan at the crease. Asif Ali goes for 30 rums. He is bowled Chahal, who has taken his 50th wicket in ODI cricket. Pakistan now 213/6 in 45.3 overs. The new batsman in the crease is Mohammad Nawaz. The two quick wickets have instilled new energy in Team India. Bumrah provides an important breakthrough for India as Shoaib Malik is caught by MS Dhoni of his delivery. he goes for 78 runs. The new man in is 210/5 in 44.3 overs. Its been a roller coaster ride for both teams so far. Pakistan now 200/4 in 43.1 overs. Shoaib Malik still batting with determination against India. He has now moved on to 78 runs off 89 deliveries. His valiant knock has taken out Pakistan out of trouble as the team is now looking to take the team to a big score. Shoaib Malik hits a boundary off the bowling of Bhuvneswar Kumar. he moves on to 72 runs of 84 deliveries. Pakistan now 182/4 as Asif hits a six. Its proving to be a big over for Pakistan. A crucial breakthrough for India. Skipper Sarfraz Ahmed out. He goes for 44 runs. He is caught by Sharma off the bowling of Kuldeep Yadav. The new batsman at the crease is Asif Ali. Pakistan at the moment is 170/4 in 40.3 overs. Shoaib Malik hits a massive six off the bowling of Ravindra Jadeja. It was a 88 metre six. He moves on to 61 runs off 73 deliveries. His shot shows his intentions. Pakistan now moves on to 160/3 in 38 overs. The partnership of Sarfraz Ahmed and Shoaib Malik have crossed 100 runs. Experienced batsman Shoaib Malik slams half-century to help his side come out of trouble, Together with captain Sarfraz Ahmed, the pair has together put on 83 runs partnership. Pakistan 141/3 in 35 overs. Ahmed is currently batting on 35 runs off 57 deliveries. In last 5 runs, Pakistan have score 24 runs without losing a wicket. Their current run rate is 4.80. Shoaib Malik is moving closer to 50 runs. It has been brilliant batting by the senior Pakistan batsman so far. India need a wicket here quickly to prevent Pakistan put a big score on the board. Shoaib Malik and Sarfraz Ahmed have till now put on a strong partnership of 74 runs help their team make comeback in the match. While Malik is batting on 47 runs, Sarfraz is on 31 runs. Pakistan 134/3 in 32.4 overs. For India Chahal and Yadav have taken 1 wickets each. Shoaib Malik hits a huge six off the bowling of Chahal. Malik hits the ball over square leg to hit the massive shot. It was great timing by the batsmen. Malik has shown his intention very clear. In the last match against India too, Malik had contributed well with the bat, before getting out in his forties. 100 runs come up for Pakistan in 28 over. Ahmed and Malik are trying to build a partnership to take their team out of trouble. They have together put on 42 runs partnership for fourth wicket. On the other hand, India is looking to get one wicket quickly to avoid letting them build a strong partnership. Pakistan captain Sarfraz Ahmed and Shoaib Malik have so far put on 32 runs partnership for the 4th wicket. While Sarfraz is batting on 15 runs, Malik is on 21 runs at the moment. Pakistan 92/3 after 25 overs. India need to one of these two batsmen out quickly to stay on top in the match. Team India bowlers bowling with tight line and length. Not letting batsmen to score rune easily apart from occasional boundaries. While Pakistan captain Sarfraz Ahmed is batting on 13 runs off 27 balls, Shoaib Malik is batting on 15 runs of 25 balls. Current run rate is 3.80. Shoaib Malik hits a boundary off the bowling of Jadaja. It was a fantastic shot by the batsman against the spinner. He is batting on runs now while Sarfraz is on 6 runs. Pakistan 72/3 at the moment in 20.2 overs. With Pakistan struggling at 65/3 in 19 overs, India is having the upper hand in this match at the moment. Both batsmen at the crease Sarfraz Ahmed and Shoaib Malik are trying to resurrect the inning for their sie. While Sarfraz is batting on 5 runs off 16 deliveries, Maalik is batting on 5 runs of 10 balls. Pakistan lose its third wicket as Babar Azam goes for 9 runs. He is ru out. After the fall of his wicket, Pakistan are now 58/3 at the end of 16 overs. New batsman at the crease is Shoaib Malik. At the moment Pakistan his having the upper hand against their opponents.